The history of the Barozais dates from about 1470 when Baru Khan, the founder of the Barozais, ingratiated himself with the Mizris who were then in possession of Dadhar and married the daughter of the chief. On the decay of the Arghun rule, the Pannis increased in power and importance, and about 1570 -1575 are found as being in possession of the Sibi fort and district. Three expeditions were undertaken by the Mughals against them. In 1595, the fort of Siwi, finally fell to the imperialists, led by Mir Masum, the soldier and the historian. The tribe is spoken of as having fought bravely and it seems to have retained its importance, as in 1695 its dependencies were held by one Mirza Khan, a Baruzai, who had received the title of Nawab from the ruler of Delhi and also administered the affairs of upper Sind. During the time of Mirza Khan Barozai, the Afghan Chief of Sibi (1666-1699 AD) eighteen battles were fought between the Panni Confederacy and the Brahuis of Kalat in the neighborhood of Sibi or Dhadar . In sixteen battles with the Barozai Ruler of Siwi, Mir Ahmad Brahui was defeated in each encounter with their forces. A seventeenth engagement took place at a spot called Pir Lehkan in which neither party obtained a decisive result. But Mir Ahmad himself, and his Minister, Akhund Mohammad Saleh, were both wounded and Mir Shawaz and Mir Ibrahim, the latter an ancestor of the Naushirwani Sardar Mir Azad Khan, lost their lives. The Brahuis left the battlefield; the Afghans collected the booty, consisting of silken belts and horses of Turki and Tazi breed. Mir Ahmad Qambrani's sister named Bibo gallantly attacked the Pannis. Attired in male garments she fought valiantly and got killed at the hand of Jalal Khan Kurak. Soon the Brahuis avenged themselves on the Pannis and defeated Rahim Khan Pirang who led the Pannis in the absence of Mirza Khan Barozai. Mullah Fazil writes: Mir Ahmad got off his horse to inspect the bodies of some of the Afghan nobles famous for their bravery in the battlefield. He smeared his moustaches with the fat of Syed Abdul Nabi and drank the blood of Shanbay Pirani (Mulla Fazil Nasab Nam-i-Barozi or History of Siwi, 1825 AD). In 1695 AD, peace prevailed between the two tribes, which was sealed by a happy marriage of Princes Mahnaz the daughter of Mir Ahmad Qambrani with Said Khan Barozai Panni, the brother of Mirza Khan Barozai. Meanwhile, in 1708 AD the Panni estate of Sibi had been almost taken over by the Kalhoras. in February 1708 A.D., that is one month after the Ghilzai rebellion and takeover of Kandhar, Panni Afghans of Siwi and Dhadar also rebelled against the Kalhora rule and, defeating the occupation forces, recaptured the twin forts of Siwi and Dhadar. Mirza Khan was succeeded by his son Bakhtiar Khan Barozai who rose in revolt against the Mughal Emperor, Aurangzeb Alamgir in January, 1702 A.D. He successfully fought for the freedom of Siwi or Sibi, but later fell a prey to a strong Mughal force led by the Subedar of Multan, Muizuddin. His successor Ismail Khan is locally credited with having built the town of Dera Ismail Khan ; he was succeeded by Isa Khan, who was followed by Ismail Khan II who accompanied Nadir Shah to Delhi and later on built the fort at Sangan. 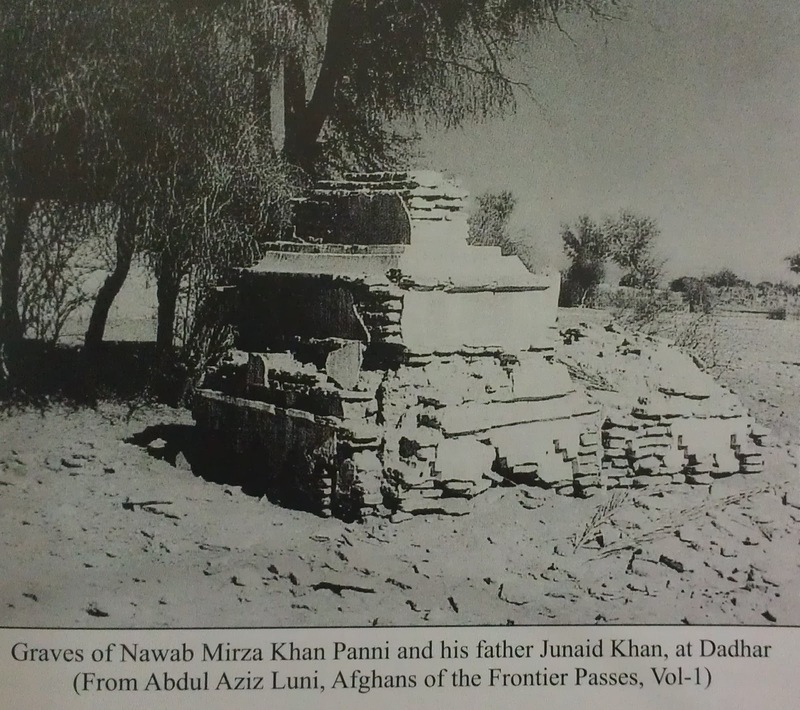 The Baruzais of Sibi appear to have become separated from the Sangan branch at this period, and during the reign of Ahmad Shah, Durrani, Muhammad Khan, who had gone to Kabul to complain of Ismail Khan, was granted a warrant dated 1759 in which Ahmad Shah entrusted the Government of the Sibi District and the Barkhan, Khethran and Hasni dependencies jointly to both claimants. Muhammad Khan was killed by the Khajjaks, a branch of the Panni tribe who had greatly increased in strength and importance, and his successor Habib Khan, who was also ultimately slain by the Khajaks, was obliged to abandon Sibi and retire to Kurk. The Khajjaks had now become the most powerful section, and their importance is shown by the common Sibi proverb which says that, "though the Kakars may conquer in the hills, the Khajaks lord it in the plains." 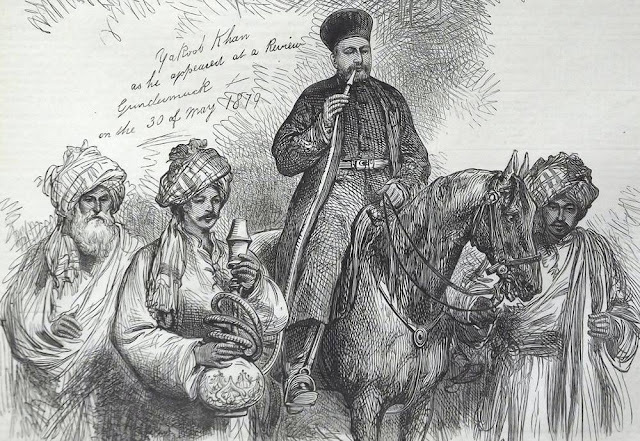 At the out- break of the Afghan war in 1839, the nominal chief of the tribe was Shakar Khan, but the real power was in the hands of Misri Khan, who tendered his services to Shah Shuja and was taken into British pay. In 184 1, as already described in the section on History, the town of Khajak was occupied by British troops and dismantled. The power of the Khajaks was thus weakened, and shortly afterwards the Marris acquired a footing in the Sibi District. They dis- possessed the Pannis of Badra and Quat-Mandai and over- ran Sangan. Shakar Khan was succeeded by his son Doda Khan, but he was a weak chief and after Misri Khdn's death the management of the tribe passed successively into the hands of Bakhtiar Khan and Sher Zaman Khan, the latter of whom was killed while endeavouring to stop a fight between the Brahuis and the Marghazani section of the Pannis. After Doda Khan's death the chieftainship of the tribe devolved on his eldest son Muhammad Khan after being unsuccessfully claimed by Sarbuland Khdn, the son of Misri Khan. According to Tarikhi Sindh (volume vi part one page 392) of Ghulam Rasool Mehr, the Dhahdar area was in possession of Barozais, with Malik Kala khan Barozai listed as owner of land thereof , upto the times of Mian Nur Muhammad Kalhora (1719-1753 A.D). Graves of Panni notables such as Junaid Khan Barozai , Mirza Khan Barozai, and well known Mullah Misri Afghan are present in Dhadar. The town of Dhadar formed the first capital of the Panni tribe of Afghans on their arrivals in the plains. It was also the place where Dara Shikoh, the Mughal prince, visited Juanid khan, the first Barozai chief and in the vicinity of which many of the famous Baruhi Afghan battles were fought towards the end of seventeenth century A.D.
Daud Khan Panni held the highest rank of 7000 zat of the Mughal nobility at the time of his death in 1715. He served as Nawab of the Carnatic and later Viceroy of Deccan. According to Raverty, he belonged to Barozai branch of Pannis In 1703, Daud Khan was appointed as the Nawab of the Carnatic. Before he was made Nawab, the Emperor Aurangazeb appointed him as a leading commander of the Mughal Army in 1701. According to The History of India by J. Murray ( 1841, , Volume 2, p-573) , Daud Khan Panni was renowned throughout India for his reckless courage and whose memory still survives in the tales and proverbs of Deccan. 1.Sibi district; text. Compiled by A. McConaghey"